The TAP FPD rounds are excellent quality tactical AR-15 rounds made specifically for use on human targets. That doesn’t mean they cannot be used on game or for target work, just that they are a legitimately tailored solution for tactical shooting scenarios that involve other human beings. This is the penultimate .223 Remington personal defense round. Period. 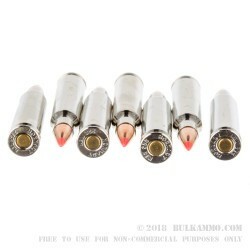 Sure, you can find other rounds that are heavier that may fit into your personal set of preferences, but you will not find a load that is more specifically designed for terminal ballistics for the aim of stopping a human target. This is the reason why they are purchased and loaded by police agencies around the world. This is a round that has a specific purpose, and it is not punching holes in paper targets. 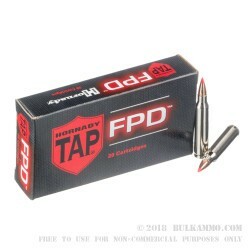 These are the 55 grain TAP FPD (Tactical Application Police – For Personal Defense) polymer tipped projectile and they are loaded in front of an extremely clean burning powder charge that offers sufficient ballistics with a brass casing, coated in nickel and Boxer primed for reloadability. 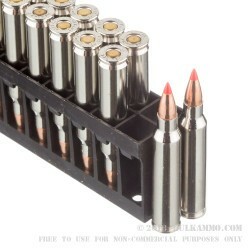 This tactical ammo reaches 3240 feet per second velocity and 1282 pound feet of energy at the muzzle. Q: Does this ammo have a steel core like other similar rounds? In the description it just mentions the polymer tip. In case I wanted to take this to a local range and test it out since they have a policy on steel cored ammunition. A: Hello Mark, The 55 grain TAP ammunition does not contain any steel in the bullet and will have no issues passing any type of magnet test. Q: I have heard that TAP Ammo is a good self defense load, But How will it preform though a silencer, not being a Sub Sonic load. A: This ammo will make less noise with a silencer/suppressor than it would without a silencer/suppressor. It will make more noise than subsonic ammo would with a silencer/suppressor. Point of impact may change slightly when comparing suppressor on to suppressor off groups. Q: This is great ammunition, is there any chance that you will be selling any of the heavier weight versions of it in the near future? A: We're always on the lookout for the best ammo values for our customers, and we've carried 75gr TAP in the past. The best way to find out what we have in stock from week to week is to check the website, because our live inventory system will show you the same information that we see.